An Iraqi asylum seeker has threatened to jump off a refugee registration center building in Berlin, RT’s video agency RUPTLY reports. The situation is happening at a refugee registration center building in Moabit, an inner city locality of Berlin. The refugee is unhappy that he has been waiting to be registered at the center for 21 days, Ruptly reports. 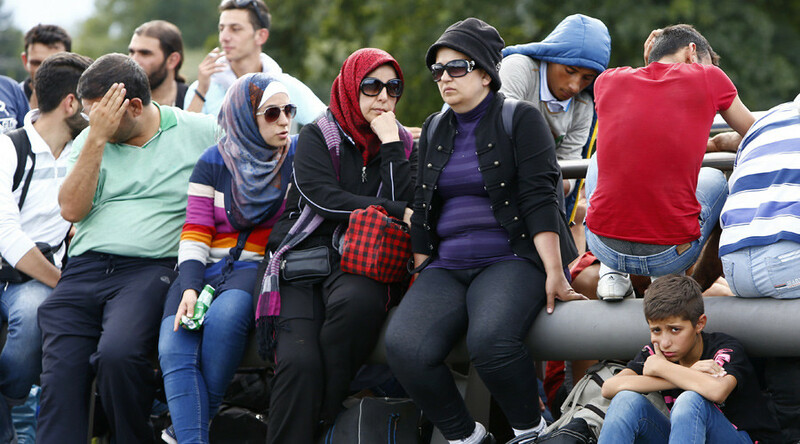 Germany, the EU's strongest economy, is expected to take in 800,000 asylum seekers this year. German Chancellor Angela Merkel said last week that Europe needed to embrace a joint system for dealing with the growing influx of migrants and refugees, and agree to binding quotas on how to distribute them across the continent. "This joint European asylum system cannot just exist on paper, but must also exist in practice. I say that because it lays out minimum standards for accommodating refugees and the task of registering refugees [and migrants]," she told a joint news conference in Berlin. Economy Minister Sigmar Gabriel, who is Merkel's deputy, said last week that a record-breaking influx of asylum seekers could actually help cut down the country's skills shortage and that companies should embrace training programs for refugees to speed up integration. The minister hailed the expected arrival of nearly a million asylum-seekers by the end of the year as "the biggest national, European challenge" since German reunification in 1990. The head of Germany's refugee office, which has recently come under fire for its handling of record numbers of asylum seekers, resigned on Thursday, the Interior Ministry said. According to German police, the number of refugees arriving in the country more than doubled on Wednesday to 7,266 from 3,442 the previous day. "Most of them were picked up when crossing the German-Austrian border," said Judith Toelle, spokeswoman for the federal police. On Thursday, the EU's migration chief criticized Hungary for its tough handling of refugees. Thwarted by a new, towering Hungarian border fence and repelled by riot police, they poured into Croatia. Croatian police said over 5,000 migrants had arrived from Serbia since Hungary sealed its southern EU border with Serbia earlier this week. Hungarian security forces fired tear gas and water cannon to disperse rock-throwing refugees on Wednesday. "Maybe the border to Croatia is open, maybe it is closed, but we are going to try," a Syrian man at the Serbian border town of Sid told Reuters. Several thousand migrants gathered at Tovarnik railway station on Croatia's side of the border with Serbia. "I may return to Syria, but only in a few years. It's too dangerous there now," another Syrian man, Kamal Al'hak, added. Differences over how to handle the influx of people, most of them fleeing war and poverty in the Middle East, have driven a wedge among the 28-nation EU bloc. Most of those arriving in Europe are Syrians "in need of our help," said the EU commissioner for migration Dimitris Avromopoulos. "There is no wall you would not climb, no sea you would not cross if you are fleeing violence and terror," he said during a joint news conference with Hungary's foreign and interior minister, noting that barriers such as Hungary has erected were only temporary solutions. Hungarian Prime Minister Victor Orban recently warned that Muslims would end up outnumbering Christians in Europe if the policy continued. In an effort to overcome differences on handling the escalating migration crisis, EU interior ministers are due to hold another special meeting next Tuesday. Croatia (the most recent country to join the EU but not yet the Schengen area) said it would not cut short the influx. This puts Slovenia next in line to receive thousands of refugees, trying to reach Austria, Germany and other wealthy countries in northern and Western Europe. Slovenian Prime Minister Miro Cerar said his country would stick to the Schengen rules, requiring it to register and fingerprint asylum seekers upon arrival. However, many refugees and migrants have refused to be registered and destroyed their identity papers, while trying to reach Germany, Reuters reported.